You have a treadmill business if you are working hard and not getting anywhere. It is frustrating for the CEO and the employees. You work too hard not to be rewarded with profit. Answering strategic questions can help you get off the treadmill. Here’s one that seems obvious, but rarely is. It is such an obvious question. Can you answer it in one sentence? Do your employees answer it the same way? 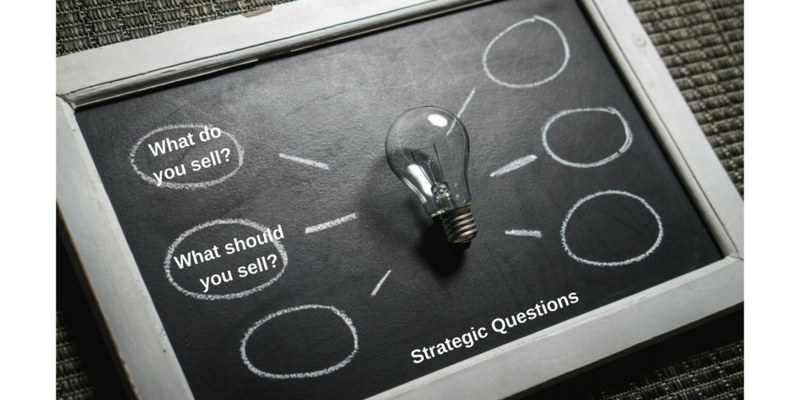 Even if everyone can answer this strategic question in one sentence, are you selling only what you should be selling? For many companies, the answer is, “We sell just about anything where there is demand.” Demand dictates the company’s offering. That answer is rational because entrepreneurs love opportunities and want to convert opportunities into businesses. In fact, many entrepreneurs have a fear of missed opportunities. So, when an opportunity comes along, they seize it. Unfortunately, that approach is rarely the way to create a profitable and valuable business. In the early days of the internet, I had one client who illustrated this reality. He was self-funded – meaning he did not have outside capital to spend, so his business could not lose money. This client did not want to miss an opportunity. He sold several different types of niche consumer appliances and expanded to world globes, scooters, and women’s shoes. He even considered frozen egg rolls. Fortunately, FedEx saved us by missing the delivery on Friday and bringing the now unfrozen egg rolls on Monday. You can imagine how seafood egg rolls smelled after sitting in a hot warehouse over the weekend. We decided we were not equipped to sell frozen egg rolls. We all laugh together about it now. That company grew revenue like crazy, but never made any significant profit. The company was a treadmill business where everyone was working hard and getting nowhere. This company had good data, and we could review the profitability of each type of product that we sold. We knew each product type’s revenue, cost of goods sold, gross profit, credit card fees, and advertising costs. Most of the product categories were losing money after paying for the product, credit card fees, and advertising. The good news was that we had two product categories where the company made a significant profit. Since no one likes a treadmill business, the strategic decision was easy: Stop selling the stuff that was losing money. The company’s revenue stopped growing for a few years as we exited product categories, but the profits soared. We were no longer a treadmill business. We were working hard and getting somewhere! Plus, the morale of the CEO and the employees improved significantly. In the United States, business is extremely competitive. That competitive landscape means that a company must produce its goods and services efficiently to stay in business and grow the business. Efficiency requires focus, innovation, and repetition. It is far more profitable to sell a lot of a few things (goods or services) than a few of a lot of different things. In the ecommerce example above, someone had to learn each product category, define the target customer for each category, select advertising to obtain each customer, design web pages, order and store the goods, and answer customer service issues for each product category. It was way too much work to do efficiently in a small company. The answer was to offer fewer product categories and sell more in the categories that remained. The proof was in the profitability and the improvement of morale. It turns out that it is more fun to win and be profitable. In a product business, the strategic questions often relate to product categories. In a service business, the strategic questions relate to the breadth of services offered. It is easy to work efficiently in one service offering. It is far more difficult to work efficiently in multiple service offerings, especially if you are trying to grow all of them at the same time. 1. Knowing what you sell means knowing what you do not sell. 2. Clarity around what you sell brings focus. 3. Focus often means selling more of a few things (goods or services). 4. Increases in repetition bring an opportunity to improve efficiency and innovation. 5. Improving efficiency and innovation bring greater profitability. 6. Better efficiency often brings better employee morale because it is easier to measure victories, and winning is more fun. As the business owner or CEO, you want the company to sell things (goods or services) to a specific type of customer where you can organize the company’s employees to beat the competition in a growing market and where you are rewarded with superior profits without running out of cash or taking extreme risks. In the next blog post, I will discuss these ten items in more detail. Until then, I will leave you with a question: What do you sell? Note: If you like the topic of strategic questions and strategic planning, I recommend Simplified Strategic Planning by Robert W. Bradford and J. Peter Duncan. You do not have to use it to develop a strategic plan; you can use it to help you ponder important strategic questions. I rely on and write about many of the principles they promote.